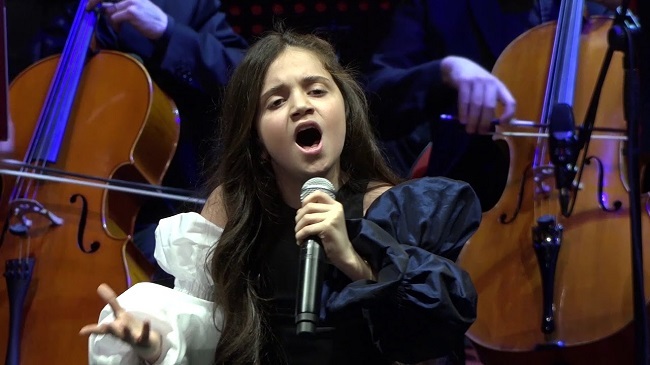 Fidan Hüseynova will be representing Azerbaijan in the Junior Eurovision Song Contest! Today, a press conference was held by Azeri broadcaster Ictimai on their participation in the Junior Eurovision Song Contest this year, to which they are returning after their last attempt in 2013. They revealed the singer that will be going to Belarus for them and it turns out to be: Fidan Hüseynova! Fidan is a 13 year old student, in 6th grade currently, who has won first place at the Testene Art Baku festival. Moreover she has been awarded the Qırmızı kitabı award of young talents of Azerbaijan and a presidential scholarship, both granted by president Ilham Aliyev. The competition will be held on November 25 in Minsk. The song is not ready yet. Fidan has been approved by ITV for participation in the competition. She is very talented. She is engaged in vocal, choreography, basketball and chess. We believe that she will represent us succesfully at the contest. My earliest Eurovision memory is "Hemel en Aarde" representing us in 1998. The first edition I saw in full was 2005 in Kyiv and funny enough the first Eurovision I went to was 2017 in Kyiv as well! A wonderful and unique experience. To me the most beautiful entry ever is 'Lejla' in 2006 and the best winning song 'Euphoria', but ‘1944’ is a close second! Who should represent Finland in the Eurovision Song Contest 2019? BBC confirm the return of ‘You Decide’ for 2019! The Public Review ‘Ktheju tokës’ by Jonida Maliqi! Lea Sirk will announce the Slovenian points! ‘Never Have I Ever’ with Tulia! “Never Have I Ever” with Lake Malawi!